Sargent Shriver was first and foremost a public servant -- to his country, to the world and to his family. His deep, unflinching commitment to humanitarian principles extended across a remarkably broad spectrum -- benefiting millions of people he never met personally, but whose lives he touched profoundly. Shriver's role as a servant came early on in life as an altar boy in the Catholic church, where his strong commitment to his faith was born. A deeply religious and spiritual man, his faith was an underlying factor in all his work. Later as a young man, he supported his country by serving five years in the United States Navy. Yet he is most widely known for his service as an effective leader of John F. Kennedy's New Frontier and Lyndon Johnson's Great Society in the 1960s. He inspired, directed, or founded numerous social programs and organizations, including Head Start, VISTA, Job Corps, Community Action, Upward Bound, Foster Grandparents, Special Olympics, the National Center on Poverty Law, Legal Services, and the Peace Corps, serving as the program's first director under President Kennedy. Shriver also ran the War on Poverty during Johnson's tenure as president, and served as the U.S. ambassador to France from 1968 to 1970. 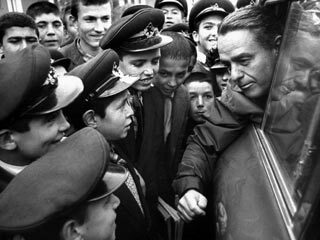 Sargent Shriver grounded all the programs he created in a core set of values that he identified as service, dedication, compassion, humility, reciprocity and the spirit of charity. Through his work and his words, he inspired a new generation of young people to devote their lives to service in lieu of careers in industry or on Wall Street. In 1964, while addressing a large crowd of college students at his alma mater Yale University, Shriver challenged them: "Break your mirrors!! Yes -- shatter the glass. In our society that is so self-absorbed, begin to look less at yourself and more at each other. Learn more about the face of your neighbor and less about yourself." At the 25th anniversary of the Peace Corps in September 1986, he implored the audience: "Be servants of peace. Weep with those who are sorrowful, rejoice with those who are joyful, teach those who are ignorant. Care for those who are sick. Serve your families. Serve your neighbors. Serve your cities. Serve the poor. Join others who serve. Serve, serve, serve! That's the challenge. For in the end, it will be servants who save us all." With his wife Eunice Kennedy Shriver, Sargent Shriver championed Special Olympics -- helping to transform it into a worldwide organization committed to changing the lives of people with intellectual disabilities. Today, his family carries on his ideals and his strong belief in public service through their own effort. A great humanitarian and public servant -- with his passing, Shriver challenges us again to serve.